Combine video and still images in one app. 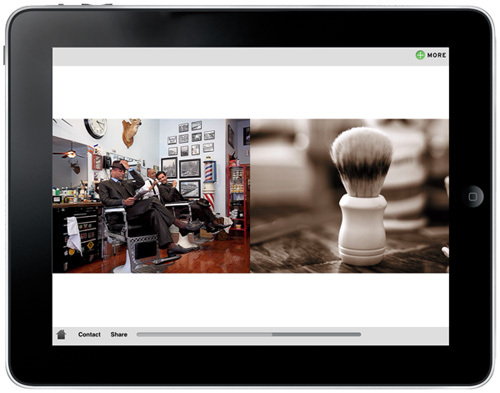 Prezent for iPad is a powerful new presentation tool for today’s cutting edge professionals. Finally you are able to create a presentation that rivals the elegance of a book portfolio, while giving an interactive experience that truly engages users. The interface is simple, clean and easily navigated, both in the creation and the viewing of your presentation. Simply stated, this is the clearest and most effective way to deliver your content to your desired audience. 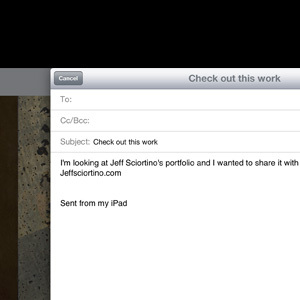 One of the key features of Prezent for iPad is its ability to seamlessly display video content alongside still images. When showing your work, you are free to put your still content in the same section as your video work, without having to switch back and forth between the two. This is a crucial element of Prezent, and one that other apps simply don't offer. Having all types of content gathered within the same collection elevates Prezent among its peers. Prezent for iPad simplifies the viewing experience for your audience. All that your audience has to do when viewing your portfolio is turn the page. Videos no longer need a play button to start, Simplifying and streamlining your work into an elegant and basic display. This small feature adds a depth and level of originality to your voice. Another amazing feature of Prezent, is the ability to support your main image with additional content. Create supplemental pages that are linked from your main page. These additional pages give you the opportunity to showcase content that might not fit into the flow of your main portfolio, but that supports your message in other ways. These might be outtakes, behind the scenes, variations, or anything else that might show your audience more of what you have to offer. Prezent makes it easy for your work to create buzz. Sharing is made simple with a dedicated share button available at all times. This button gives your audience a way to share your work with anyone they choose, extending your reach to limitless potential. What is up with the bar on the bottom of the portfolio screen? The Navigation bar on the bottom of the screen acts to help your user get around your portfolio. It contains a “Home” button, which brings you back to the first slide and beginning of your portfolio. A “Share” button that brings up a customizable email for you to send out. A “Contact” button that brings up a customizable page containing your information. The progress bar at the bottom not only tracks your progress in the portfolio, but allows you to skip to any part of the presentation at anytime. What types of image files can I add to Prezent? Image files should be in either jpeg, tiff, png, bmp, or psd file format. All others are not compatible. What types of Video files can I add to prezent? Files with an “mp4” file extension, with an h.264 codec, should be used exclusively. Does the share button share the entire presentation? No. The share button allows you to share the users website link and short message. This app is specifically for interpersonal presentations. The iPad presentation that you have created cannot be exported or shared. What dimensions should I make the images? If you're using an iPad 3 or later we suggest images at 2048x1536 or 1024x768 for the iPad 2 and below, remember to compensate for the navigation bar at the bottom of the screen, we recommend taking this into account when designing your pages. We made ours 1024 x 652 to account for the nav bar, as well as creating a nice border at the top. I’ve made a portfolio, how do I get back to the edit screen? There is a hidden button located at the top middle of the screen, press this to get back to the Administration Panel. I’ve found my way to the Supplemental Pages, how do I get back to the Main Portfolio? Press the back arrow once until you are back to the page in your main portfolio. Then swipe as normal to navigate the presentation. Prezent App © 2013. All Rights Reserved.